Yaxley's Kyle Nolan (left) and Wayne Morris attempt to break up an Erith & Belvedere attack. Photo: Alan Coomes. Holbeach United will represent the United Counties League in the last 16 of the FA Vase after Yaxley’s best-ever run in the competition came to an end in the fourth round today (January 18). Yaxley were beaten 1-0 by an early goal at Southern Counties Premier Division side Erith and Belvedere despite delivering their best performance for some time. Rob Hughes saw a first-half penalty saved and Liam Hook hit a post before Dan Cotton spurned two good late chances. Yaxley had never previously been past the third round stage. They were denied further progress by a man-of-the-match display from the Erith goalkeeper. Holbeach were within seconds of being knocked out in their tie at fellow UCL side Thurnby Nirvana yesterday (January 17), but eventually came through 4-3 after extra time. In a spectacular game Holbeach led 2-0 through Livo Dube and Matt Nolan before the home side hit back to lead 3-2 going into added time at the end of 90 minutes. Then Thurnby saw a player sent off and Kern Miller grabbed a 95th-minute equaliser. Jamie Clarke scored the winner for the Tigers in the 107th minute. The draw for the last 16 takes place tomorrow (January 19). Holbeach did fall eight points behind United Counties Premier Division leaders Rushden & Diamonds as a result of their Vase commitments. Diamonds beat Sleaford 3-0, but Holbeach now have four games in hand on the leaders. 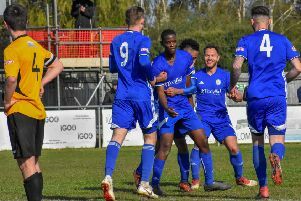 Peterborough Northern Star fell to a disappointing 1-0 defeat at home to Wellingborough Town and lost fourth spot as a consequence thanks to Wisbech Town’s 7-0 romp against Harborough. The Fenmen were 4-0 up insde 20 minutes. Adam Millson and Tommy Treacher both scored twice. In Division One there was a debut goal for Karl Gibbs as Peterborough Sports got their promotion bid back on track. Matt Barber and Dan Clements also scored in a 3-0 win over Burton Park Wanderers that has lifted the city side to within one point of the promotion places. Blackstones played their first game for a month, but went down 4-2 at home to Woodford United. Two goals from Kieran Arthur saw Stones’ 2-1 up midway through the first-half. Spalding United manager Paddy Rayment resigned on Friday (January 16), but was in the managerial dug out yesterday to see his side score twice in the last five minutes through Lee Clarke and Tom Waumsley to claim a 2-2 draw at Norton United in Division One South of the Evo Stik Northern Premier League. The Tulips are unbeaten in 13 matches, but slipped a place to fifth following yesterday’s draw. Rayment’s resignation wasn’t apparently accepted bv the Spalding board and he has agreed to carry on working for the club. Stamford were beaten 3-1 in foul conditions at Curzon Ashton in the Premier Division. Ryan Robbins scored a consolation goal for ‘The Daniels’ from the penalty spot. Stamford host Spalding in the Lincs Senior Cup on Tuesday night (January 21). Erith & Belvedere 1, Yaxley 0. Thurnby Nirvana 3, Holbeach United 4 (Dube, Nolan, Miller, Clarke). (After extra-time, 3-3 after 90 minutes). Curzon Ashton 3, Stamford 1 (Robbins). Norton United 2, Spalding 2 (Waumsley, Clarke). Deeping Rangers 2 (Burton-Jones, Scotcher), Kempston Rovers 1. Peterborough Northern Star 0, Wellingborough Town 1. Wisbech 7 (Millson 2, Treacher 2, Beaumont, Smith, Johnson), Harborough Town 0. Postponed: Long Buckby v Huntingdon Town. Blackstones 2 (Arthur 2), Woodford United 4. Peterborough Sports 3 (Barber, Gibbs, Clements), Burton Park Wanderers 0. Postponed: March Town v Great Yarmouth.